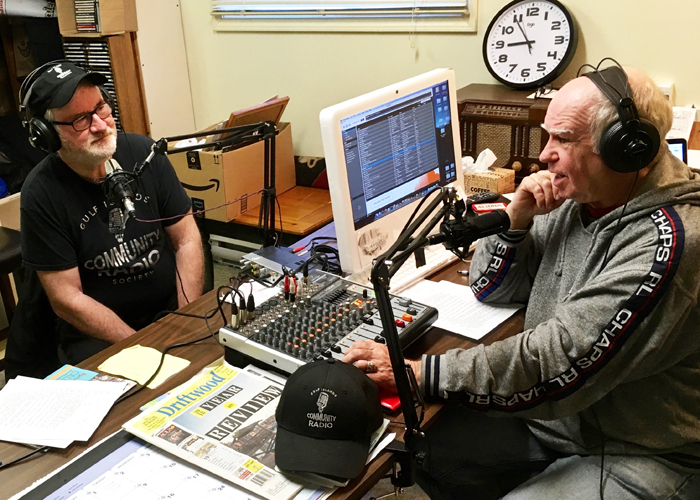 Gulf Islands Community Radio Society president Damian Inwood, left, with online morning show host Scott Merrick at the society’s current studio at Salt Spring Seniors. Salt Spring Island may have been without a radio station for the past three and a half years, but a non-profit society working to re-establish the service hopes the silence will be broken in the not-too-distant future. The Gulf Islands Community Radio Society recently submitted its application for a licence to the Canadian Radio Telecommunications Commission. Inwood said it could take a year for the licence to be approved, and society members may have to attend a hearing in Ottawa as part of the process. Some existing stations on Vancouver Island and the Lower Mainland have the right to object if they feel a Salt Spring-based station could interfere with their signals. The group has submitted a request for call letters CHIR, with the IR representing “Islands Radio,” and it will be pronounced “cheer.” As the society’s name implies, they would like to include the other Gulf Islands in their coverage. Transmitter locations on Mount Belcher and Mount Bruce are also the same as the previous CFSI station, which operated as a commercial venture under two different owners from 2009 to 2015 until its licence was revoked by the CRTC, but Inwood said better equipment would be used. Current islandsradio.ca programming sees Scott Merrick host a morning show from 7 to 9 a.m. Monday to Friday, which is also repeated in the evening. Music is otherwise heard on the site. The group is inviting anyone interested in doing a program, either online now or through the station when it gets going, to send proposals to Inwood at president@gicrs.ca. For more on this story, see the Jan. 16, 2019 issue of the Gulf Islands Driftwood newspaper, or subscribe online.